My son from Arizona has been here for several days now and will be going home tomorrow. I have thoroughly enjoyed the time we have spent together. But it sure does fly by when your children are only home for a visit. 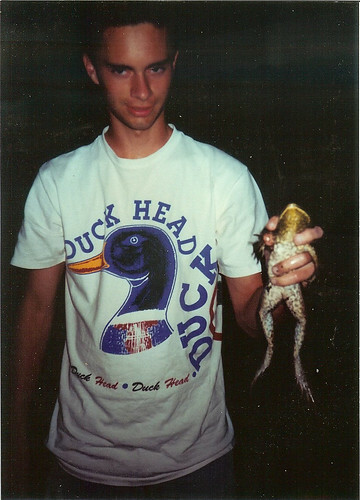 Here is a picture of him when he was about 15 or 16 holding a bullfrog that we had in the small pond in our front yard. We dug it with a shovel and had some fish in it until one of our cats waded into it and snagged one of them! Who says cats are scared of water??? This one wasn't! I will post more pictures of Jer later! Right now I need to go to bed so I can get up in the morning!